A comprehensive approach to protecting human rights requires the harmonisation of domestic law with international treaties. In Mexico, the processes to achieve this have often been very protracted. Take the example of the Victim’s General Law, enacted in 2013. Harmonising domestic law with international treaties was advocated over many years, by the victims of the war on drugs, the victims of guerrillas, other victims’ movements and human rights defenders, including those working on femicide. There were many issues to consider in framing this domestic law: the inclusion of victims’ families in investigations and in legal proceedings, their protection from intimidation, compensation provisions for victims and their families, a national registry of victims, and a national assistance fund for victims, among others. Specific cases illustrated the challenges victims or their families faced and helped inform policy and the Law’s proposal. Multiple stakeholders were involved in the considering the new law, including academics, lawmakers in Congress and Senate, and wider civil society. Although the law faced a series of challenges, it has been passed and is being implemented. In brief, developing a comprehensive Victim’s Law was a great achievement for Mexicans after a long and difficult process. A Togolese human rights organisation, CACIT (Collectif des Associations Contre l’Impunité came to Mexico and heard first-hand about the Mexican Victim’s Law from the actors that participated in the process. He saw its merits and decided to promote a similar law in Togo. They took the brand new Law that had been approved in Mexico in 2013, translated it into French, and began advocating for a similar approaches in Togo. After three years of advocacy, CACIT have contributed to Parliament’s decision to include the criminalization of torture in a new Criminal Law approved in February 2016. CACIT’s contribution was to use the comprehensive Mexican law as a basis for improving their own Criminal Law. Within his organisation, Ghislain Koffi Dodji Nyaku made this story possible. Ghislain is the Director for the protection of human rights in CACIT. In 2013, he participated in a Learning Alliance under the ELLA Programme, a UK Aid funded south-south knowledge exchange initiative that mixes research, exchange and learning to inspire evidence-based policies and practices. Together with FUNDAR, a Mexican think tank, Practical Action Consulting Latin America managed a Learning Alliance on Human Rights in which Ghislain and peers from Latin America, Africa and Asia discussed, among many other issues, the Mexican Victims Law. After a 4-month dialogue, it was clear to all participants that countries interested in designing and implementing effective legal frameworks for human rights can learn from similar experiences in other regions of the global South. Ghislain visits Mexican Senate during the ELLA Study tour to Mexico. As part of the Learning Alliance, Ghislain had the opportunity to visit Mexico where he learnt first-hand about the experience: “We took the Victim’s Law from Mexico to Togo. We sat together with our staff, we translated it into French and we prepared our advocacy to the National Assembly and other authorities involved in the development of a new criminal law” said Ghislain in an interview recently. CACIT contributed to changes in the National Criminal Law to set up mechanisms to monitor and prevent torture and human rights violation in prison. Ghislain recalls that CACIT used to engage in torture cases after the violation had taken place, but now they are able to engage beforehand, to try to prevent violations. Ghislain’s experience in Mexico also helped him to adjust some of CACIT’s other approaches to victims. CACIT changed their support method to victims, to help them to organise themselves, and to build their own capacity to face likely challenges. 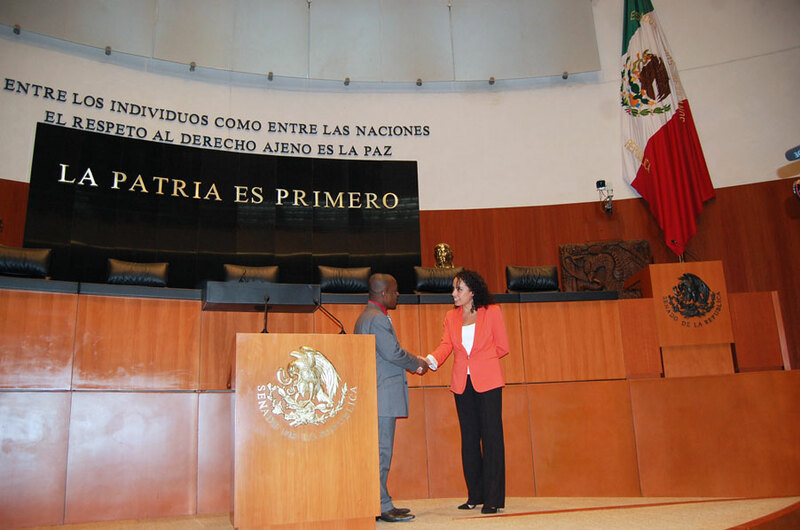 Also based on the experience of different countries in Latin America, particularly in Mexico, CACIT is now adopting a strategy to improve its own relations with the Togolese authorities: “In Mexico we met the parliamentarians, supreme courts, senators, we realized they have worked with Fundar directly to prevent violation and advocate for human rights. So now here we are doing the same, we are adopting the same approach. Before we did not work with the authorities so frequently. Now we have a good relation with them and contact them directly to help the victims. We have improved our ways to engage with authorities”, said Ghislain. Stories like Ghislain’s and his role on the improvement of a new Penal Code in Togo show that south-south exchange can contribute to change when there are windows of opportunity, and where programmes work with committed, capable individuals able to deploy the knowledge they picked up when the opportunity develops. In the ELLA programme UK Aid bet on the benefits of south-south learning. Ghislain’s story is just one case among the many registered by the programme. Knowledge exchange between regions of the ´global south’ can work, even where countries are very different, when sufficient attention is paid to identifying and understanding context. In this case, knowledge uptake happened because Ghislain took a Mexican law and used it to propose improvements to the legal framework in Togo through the determined work of his organisation. This article has been written by Alicia Quezada, Manager of Practical Action Consulting Latin America, and is based on an interview with Ghislain Koffi Dodji Nyaku (11 March 2016) and programme reports, including a report on the ELLA Learning Alliance on Human Rights “Module 1: A Framework to Protect and Defend Human Rights”.